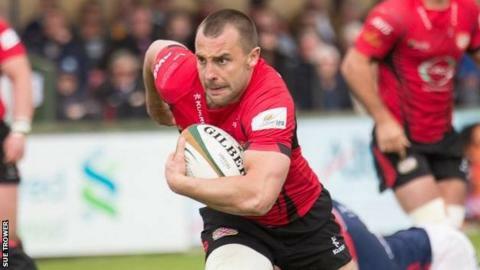 Jersey head coach Harvey Biljon says Nicky Griffiths' decision to leave the club is "a huge loss" for the side. The 29-year-old former Wales sevens scrum-half on Wednesday. "Ultimately it is a huge loss. He was a big character around the club and also part of our plans," Biljon said. "From a coaching point of view, we thought he would have had a huge impact going into this middle part and end part of the season." He had six months left to run on his contract, which he signed in the summer of 2013. But Biljon told BBC Radio Jersey he is not going to rush to bring in any new players to St Peter. "I think we need to bring someone in but, at the same time, it's a very difficult time of year to find the right recruit. "When Tommy Bell left, we didn't jump on finding someone immediately, we don't just want to automatically fill a position because there's a space. "We've still got to make sure that person fits into our club, fits into the unique environment that Jersey is about and wants to buy in with what we want to do."